I just yanked the engine out of my 1948 Willys CJ-2A; here’s a look at the innards of that old cast iron hulk called the “Go Devil” that powered America’s troops through World War II. 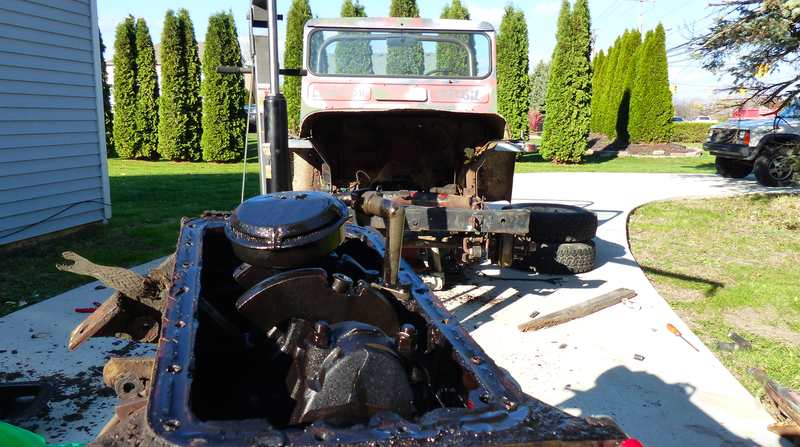 The Go Devil engine is a 134-cubic inch, cast-iron flathead inline four found in World War Two Jeeps and a slew of other Willys vehicles, like my rusty 1948 CJ-2A. As I plan to take my barn-find junker on a 2,000 mile journey to Moab, Utah to go off-roading on America’s most challenging trails, I figured I’d have a look inside the legendary motor to make sure it doesn’t, you know, blow up or anything. That left us with just the radiator, so we unbolted it from the tabs on the crossmember, loosened the hose clamps, yanked the two hoses off, and gently lifted the copper-brass heat exchanger right out of the engine bay. That left us with a nice gaping hole in the front of the Jeep from which to remove the Go Devil. From there, I drained the oil, expecting it to be a clumpy, milky hot mess, but it actually wasn’t nearly as bad as I’d expected from this neglected old farm vehicle. Then we fastened the motor onto an engine stand and removed the water pump, which had been leaking buckets of coolant onto my driveway. The water pump had quite a bit of surface rust on the impeller, but luckily, it’s rebuildable for about 35 bucks. So far so good. The entire cooling system was filled with rust, but that should clean out fairly easily. After removing the water pump, Brandon and I removed the remaining cylinder head nuts. With all the nuts removed, the head should have just slid right off the top of the block. But, because nothing I do ever goes as planned, and perhaps because of all that rust in the cooling system, a few of the studs were somehow seized inside the cylinder head. This is a bad idea, because the head and engine deck are machined perfectly flat to ensure a good head gasket seal. If you wedge a pry bar between the two, you risk scarring up the mating surface, causing a leak in the gasket. But I didn’t care, in part, because — as I mentioned before — I was blood-boilingly frustrated, and in part, because this thing is cast iron. “It’ll be fine,” my friend and I reassured ourselves as each of us hung our entire bodyweight on the end of that pry bar. But the pry bar wasn’t enough; even with all the curse words in my vocabulary, I could only convince the head to move about three inches off the block before it just refused to move any farther. But even with three studs cut, Brandon and I still had to toil with that darned cylinder head for hours, finally getting it to budge late at night as our muscles began to ache from yanking on that heavy rectangular chunk of iron. With that off, we could finally get a nice look at the top of the motor, with its intake and exhaust valves sitting right there on the top of the block. The good news is that neither my cylinder head, nor my block had been significantly scratched by my friend and me hammering and prying on that crowbar like a couple of cavemen. Also on the “good news” front: the engine has apparently been bored out 0.030 inches over stock, as indicated by the tiny stampings on the tops of the pistons. This is great news, because Go Devil engines tend to quickly wear out their rings and bores, since the engines have very long strokes, which drag those rings a long way along that oil boundary. Further inspection yielded more good news: none of the valves are broken, and rotating the engine by hand confirmed they are all functioning properly. I’m not sure if they were actually sealing properly (and with only 60 psi of compression, I would guess not), but I’ll remove them and give them a thorough lapping. Hopefully that will help. The cylinder walls also looked fine, with no obvious deep scars, and only a small lip between where the piston rings ride and the untouched bore. I’ll probably hone them anyway and put in a new set of rings, as 30-over rings only cost about $45, and I need to bring my compression numbers up. There’s more good news on the bottom end, as there’s nothing obviously wrong with the crankshaft, oil pump or timing gears. Sure, there was some sludge on the bottom of the oil pan, but it wasn’t ridiculous, and there were no large chunks of metal down there, thank heavens. I will say, after measuring only 60 psi of compression in this engine, and opening my transmission to witness a total horror-show, I was expecting this motor to totally shot. But it’s not.